Who doesn’t love a cold beer at a BBQ on a hot summer day? Well your BBQ just got even better, because according to a new study, using it to marinate your meats before grilling can actually help reduce your risk of cancer. Studies have found that grilled meats can sometimes contain cancer-causing substances after cooking. Some may argue that grilling meat gives it great flavor. This taste, though, comes at a price, since the process creates molecules called polycyclic aromatic hydrocarbons (PAHs) which damage DNA, and thus increase your chances of developing colon cancer. But now, in a study published in the Journal of Agricultural and Food Chemistry, researchers said they found a way around the problem. 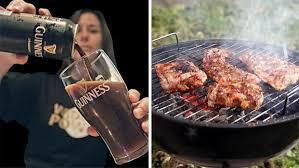 When barbecuing meat, they suggested, you should add beer.